It is rare that philosophical ideas can change the world. Yet Peter Singer, Ira W. DeCamp Professor of Bioethics at Princeton, has changed the world via his ideas and actions. Widely recognized to be “the world’s most influential living philosopher,” Singer has authored 33 books. His books, Animal Liberation and Practical Ethics have been translated into 32 and 23 languages respectively. His ideas have made formative contribution to the animal liberation movement. He has written influential works in bioethics (including abortion, euthanasia, infanticide, and surrogacy), on vegetarianism, world poverty, effective altruism, climate change, as well as more theoretical topics, such as Darwinianism, utilitarianism, intuitionism and meta-ethics. Singer was selected by Time Magazine as one of the 100 most influential people in the world, and Animal Liberation (1975) has been included in Time Magazine’s recent list of 100 Best Nonfiction Books published since 1923. Singer was ranked third on the Gottlieb Duttweiler Institute list of "Global Thought Leaders 2013." 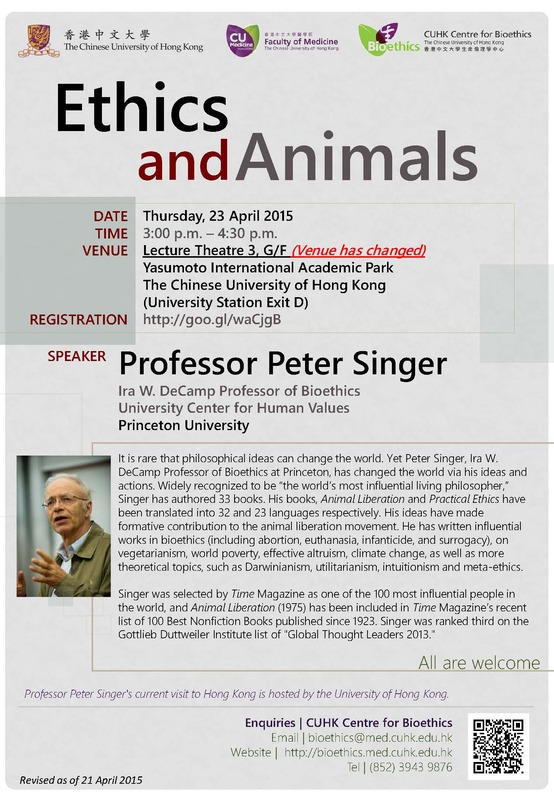 *Professor Peter Singer's current visit to Hong Kong is hosted by the University of Hong Kong, where he will give the Second Century Lecture.